Kathy Morton tells me she started up the Sweet Retreat 11 years ago this July, and it is one of the more stable & well-loved places on the island to get lunch, or coffee, or a smoothie, and much more. 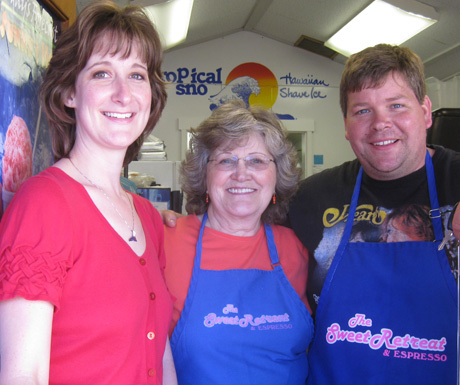 Well, on May first, the Sweet Retreat got new owners, as Kathy’s son Dave and daughter-in-law Michele took over the operation of the place. Dave will be there working, while Michele continues her work at the bank. Kathy says she’s going to work the summer with Dave, and then see what happens after that. It’s great to know that there will still be cheerful, smiling faces at the place this year – congrats, Kathy!